Pre-owned in very good condition. Beautiful pair of shoes, no flaws, only normal wear. We will disclose any imperfections if found. Size: 10 US. Color displayed may vary depending on your screen. AK Anne Klein Shoes. Leather Upper. Insole from center heel to center tip of toe: 10.60”. Heel: 1.75”. Anne Klein New Black Pump Size 10 M. Condition is New with box. Anne Klein IFlex suede leather slip on wedge sandals. Size 10 M. (Sku:Q8). 2.5" wedge heel. Size 10M iFlex Pointed Toe Slip On Textured Slim Heel. Anne Klein Heels. 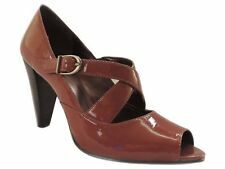 Elegant heels from Anne Klein in a light taupe color and crocodile or alligator embossed pattern. Anne Klein's classic but feminine footwear is geared towards the professional, executive and classic woman that looks for functional and fashionable shoes. Dress & Formal. Fashion Sneakers. Toe Style: Open Toe. Bottoms of the shoes are in good condition and have very light dirt.The right shoe has a mark as shown in the pictures listed. Insoles of shoes are in good condition. Shoes are in overall great condition! Leather Upper. Manmade Sole. New without box. ~ ~ ~ ~ ~ ~ ~ . S ho es are Used With Signs of WearingD ir t Ma rk s, N ic ks, ScuffsAnd Scratch Marks.